Arrive at the selection screen. Select the Advanced button to set a static IP address for the selected device. 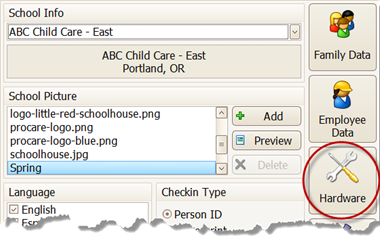 Assign the address the IP address and choose Add to List. 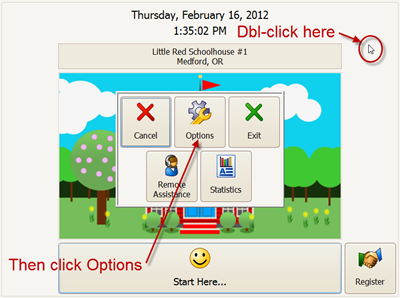 Select the Advanced button to change the name of the selected device. 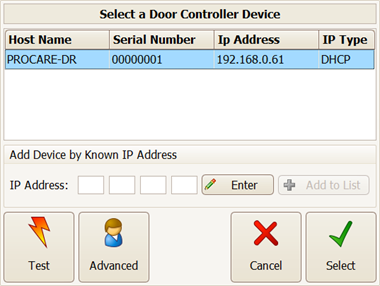 If you have more than one door controller, changing the name may be helpful to identify the location, such as “FRONT DR”, “BACK DR”, etc. If the Door Controller is on a different network segment than the Check-In machine, manually type its IP address and choose Add to List. Or, choose Edit to display an on-screen keyboard (use a period to separate octets, like 192.168.0.25) and then choose Add to List.